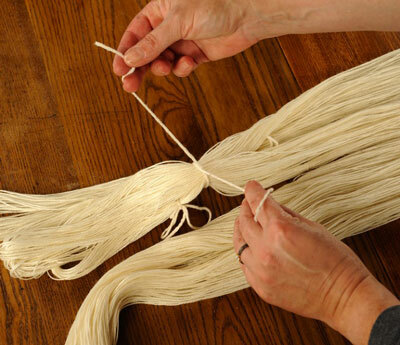 Winding and tying skeins is often necessary when you are hand-dying yarn. 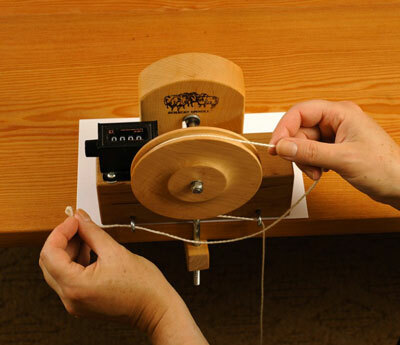 For winding, you use a warping board, which is a weaving tool that can come in handy for working with skeins. If you are trying this technique for the first time, you may be able to borrow a board from a member of your local weavers’ guild. While most warping boards are approximately 1 yard wide, they can vary in number of pegs. 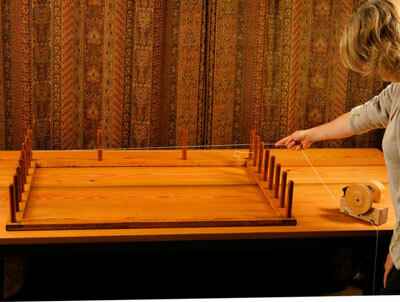 You can use any warping board, even if it has fewer pegs than the one used here. If you have fewer pegs, your skein circumference will be smaller. Form a loop in one end of the yarn and knot it. Thread the yarn through the yardage counter. 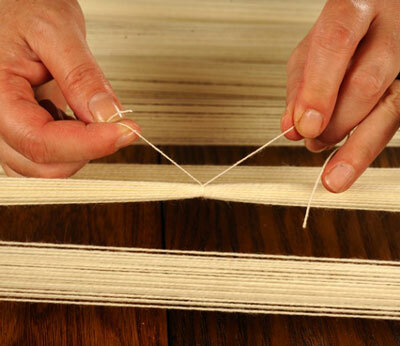 Then place the loop over the peg in the upper-right corner of the warping board (peg #1 in diagram shown in Step 2). Your skein will begin and end here. Begin to wind the skein running the yarn from peg #1 to peg #2 at the left side of the board. Go around peg #2 and run the yarn across the board again, wrapping around peg #3 on the right. 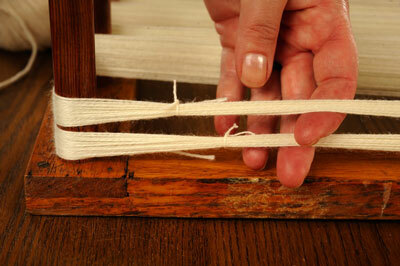 Continue wrapping the yarn around each peg in succession as you go back and forth across the warping board. Keep a light, even tension, but do not stretch the yarn. When you reach the last peg in the lower-left corner (peg #16), wrap the yarn around the peg and then bring it from left to right along the outside of the board and back up along the pegs on the right side to where you started. This creates one full circumference of the skein. 4.Continue to wrap consecutive “laps,” always following the same path with the yarn. Keep your eye on the yardage counter. The skein will be 400 yards (366m)—enough for a pair of socks—but you will want to stop winding and place a marker at 200 yards (183m) so you will know where the second sock begins when knitting. 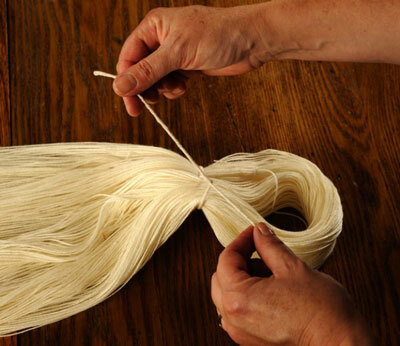 Do this by tying a string around the skein when you reach 200 yards (183m). Then continue to wind. Placing ties at set intervals keeps the long skein intact and indicates where color changes will occur. 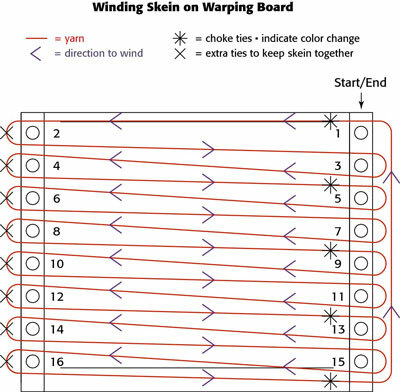 Each tie made on the right side of the warping board is a secure choke tie—a firm double knot—to keep the strands of yarn from sliding and becoming tangled. The choke ties are removed as you paint the skein, but they are necessary for keeping the skein under control until then. The choke ties will also indicate the places where you change color. Place a tie around the second 200-yard (183m) portion of the skein, at peg #1. You now have ties separating the two halves of the skein. Then place a second tie around the entire skein at peg #1. Place the choke ties at approximately 4-yard intervals, which occur at every other odd-numbered peg on the right. These ties indicate where colors will change. A 4-yard color segment will translate into roughly four knit rows in a stockinette sock pattern. Place a tie on peg #5. Continue to place consecutive ties on every other odd-numbered peg on the right side of the board (pegs 9, 13). Your last choke tie equally divides the long run from peg #16 at the lower left to peg #1. Place firm bow ties at each of the even-numbered pegs on the left side of the board. The bow ties do not indicate color changes. They will simply keep the skein in order. 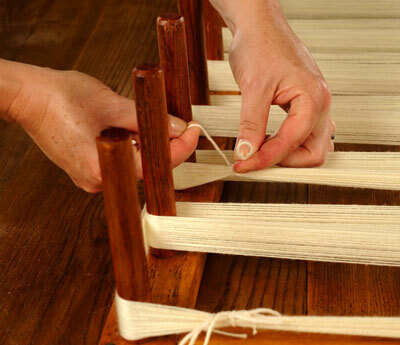 Remove the skein from the warping board, one side at a time. Fold the skein back and forth upon itself and tie it in two places to hold it together.